Catch Flights Not Feelings Care short-sleeve crewneck t-shirt. Unisex Fit. Printed with eco-friendly water-based inks. Please refer to the size chart in the last image of the listing (laying flat measurements in inches). Due to the calibration differences between computer monitors, phone screens and tablets, the actual product color may vary slightly from what you are viewing. These t-shirts are Unisex (close to men’s tees sizes). Please refer to the size chart in the last image of the listing (laying flat measurements in inches) if you'd like to measure it against one of the shirts you currently wear. All garments are measured lying flat, unstretched. This may be slightly different than your measurements taken by measuring yourself with a tape. To find your measurements, the best thing you can do is to measure a garment that fits you well. It normally takes 1-3 business days to process an order and then delivery is another 3-5 days with standard shipping or 2-3 days with Priority Mail. Do not iron directly onto the print! 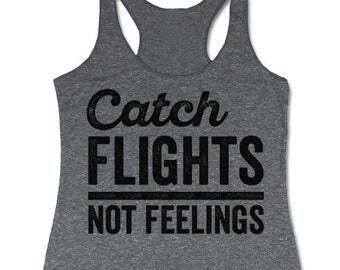 Catch Flights Not Feelings Tank Top. Racerback Tanks for Women. Flight Attendant Tank. Travel and Adventure Tank. 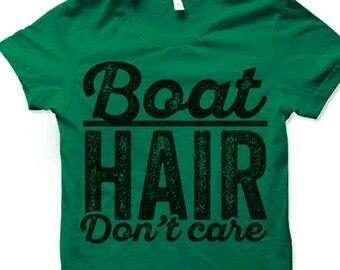 Boat Hair Don't Care Shirt. Travel and Sailing T-Shirts. 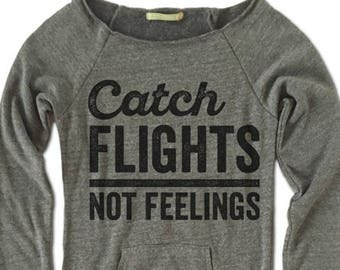 Fun Travel Clothes. Traveler Gift. Adventure Shirt. Boating T-Shirt. 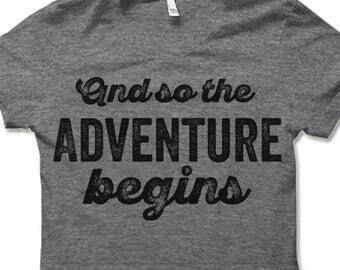 And so the Adventure Begins Shirt. Travel and Camping T-Shirt. Fun Travel Clothes. Traveler Gift. 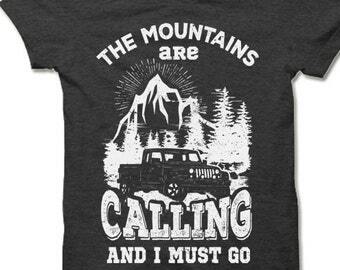 The Mountains are Calling and I Must Go Shirt. 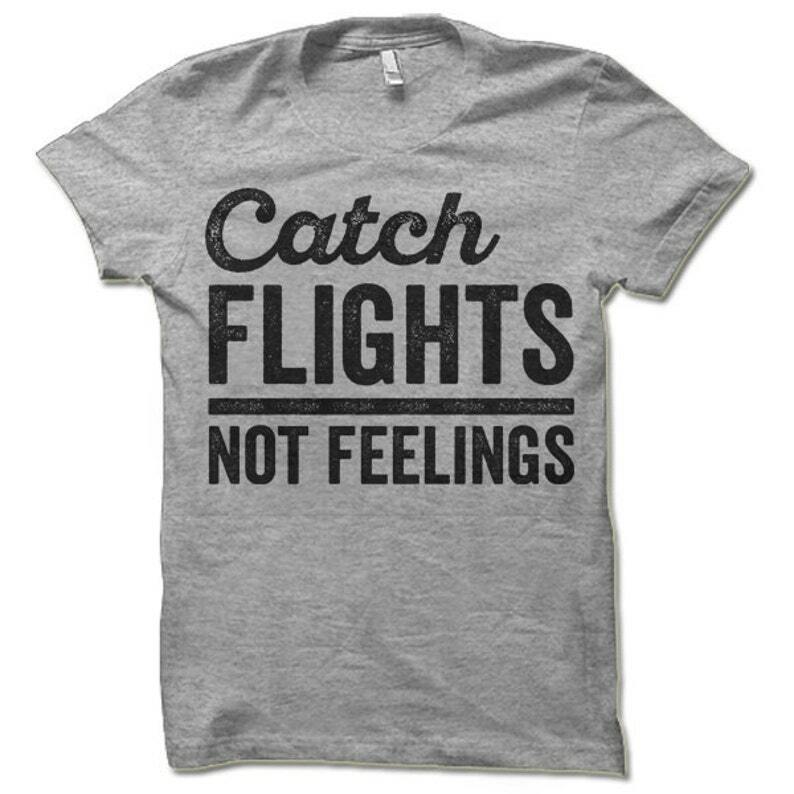 Travel and Camping T-Shirt. Fun Travel Clothes. Traveler Gift. 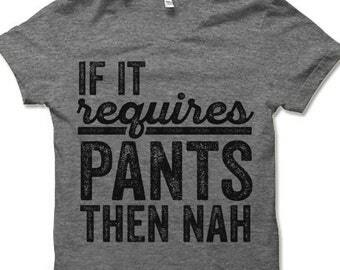 If It Requires Pants Then Nah T-Shirt. Funny Shirts. Tumblr Shirts. 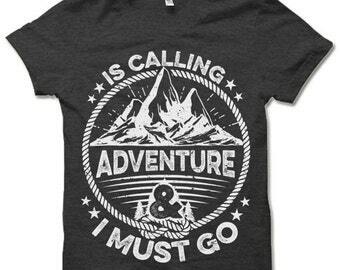 Adventure Is Calling and I Must Go Shirt. Travel and Camping T-Shirt. Fun Travel Clothes. Traveler Gift. 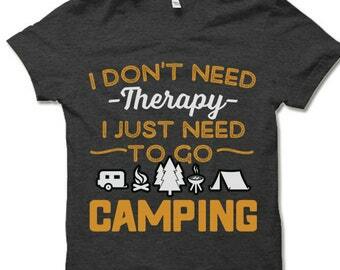 I Don't Need Therapy I Just Need To Go Camping Shirt. Travel and Camping T-Shirt. Fun Travel Clothes. Traveler Gift. LOVE! This is the best shirt! High quality Bella canvas tshirt, excellent quality. Super fast shipping. We do not offer any gift wrapping at this time but we can exclude the receipt or include a gift note. Please request to include a note via the order comments section at checkout. We can fill wholesale orders of the same design, with as little as a 100 shirt minimum. Please contact us for details. Wholesale orders are non-refundable. How long does it take to ship a Domestic Order? It normally takes 1-3 business days to process an order and then delivery is another 2-5 days with standard shipping or 2-3 days with Priority Mail. All orders are shipped from NY. Please note: we cannot be held responsible if you do not allow at least 7-14 business days from your date of purchase to your need by date. It is your responsibility to make sure you provide correct shipping address. Please note that If USPS tracking states that your package was delivered, we are not responsible for claims that a package did not arrive. In such a case please contact your local post office directly. How long does it take to ship an International Order? You will receive a confirmation email once your order has been processed and packaged. Tracking information is normally available within 24-72 hours. International shipping can sometimes be very slow. Please allow at least 2-4 weeks for delivery. The average is about two and a half weeks but it is not unusual for it to take longer. Also, please be aware of customs fees if you have in your country, you are responsible to pay them. Please note that If USPS tracking states that your package was delivered, we are not responsible for claims that a package did not arrive. We suggest contacting your local post with your tracking information to find which customs center processed your order. They may be holding it there. 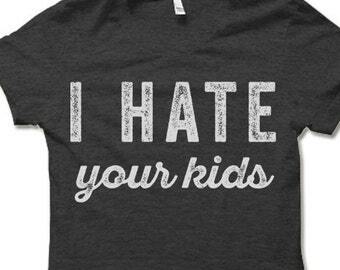 I Hate Your Kids T Shirt. Funny Tee Shirts. Tumblr Shirts. 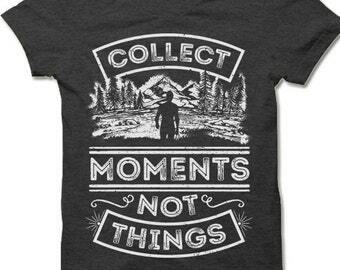 Collect Moments Not Things Shirt. Travel and Camping T-Shirt. Fun Travel Clothes. Traveler Gift. 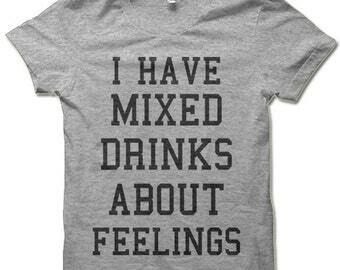 I Have Mixed Drinks About Feelings T-Shirt. Funny Shirts. 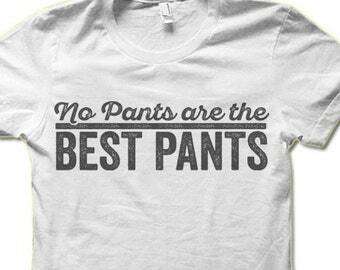 No Pants Are The Best Pants T-Shirt. Funny T-Shirts. Tumblr Shirts. 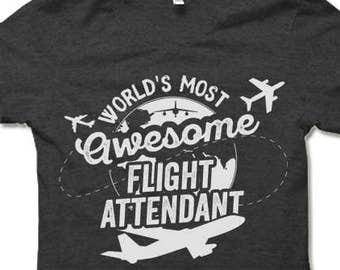 World's Most Awesome Flight Attendant T Shirt. 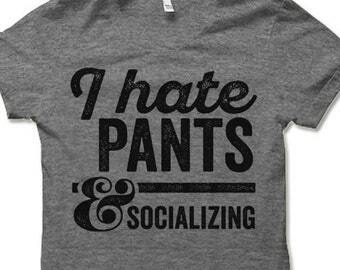 I Hate Pants and Socializing T-Shirt. Funny Shirts. Tumblr Shirts. 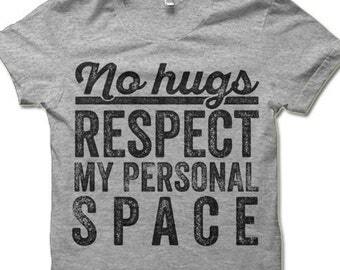 No Hugs Respect My Personal Space T-Shirt. Cool Anti Social Tee Shirt. Funny T-Shirts. Tumblr Shirts.